WARREN MILLER’S ‘FACE OF WINTER’! There are so many “faces of winter”, from your buddies you ski with, to the lifties, ski patrol, ski school, the little groms ripping around the mountain and the unknown skiers sharing the lift line with you. There is one face of winter that we all know, and that is Warren Miller, the man who has been introducing winter each year for 69 years with his annual ski and board films. Warren passed away this year and we all mourn the loss but his films and the tradition of the annual Warren Miller premier lives on. The late, great Warren Miller built his legacy capturing the essence of winter magic, and today that legacy launches the start of the ski and snowboard season every year. In the 69th feature film, celebrate the man who became known as the face of winter throughout the industry, and the places and people he influenced along the way. This year, new and veteran athletes come together to pay tribute to the man who started it all, including Jonny Moseley, Marcus Caston, Seth Wescott, Forrest Jillson, Kaylin Richardson, Dash Longe, Anna Segal, Michael “Bird” Shaffer, and featured athletes of the U.S. Cross Country Ski Team, including gold medalist, Jessie Diggins. Watch as they visit some of Warren’s favorite places from Engleberg to Chamonix, British Columbia to Alaska, Chile, Iceland, New Zealand and more. The film is for anyone whose life (whether they realize it or not) was impacted by Warren Miller. We are all the face of winter—from the athletes to the audience to the locals in far-off destinations or even at our home mountain. Warren recognized this, and this year’s film celebrates that. 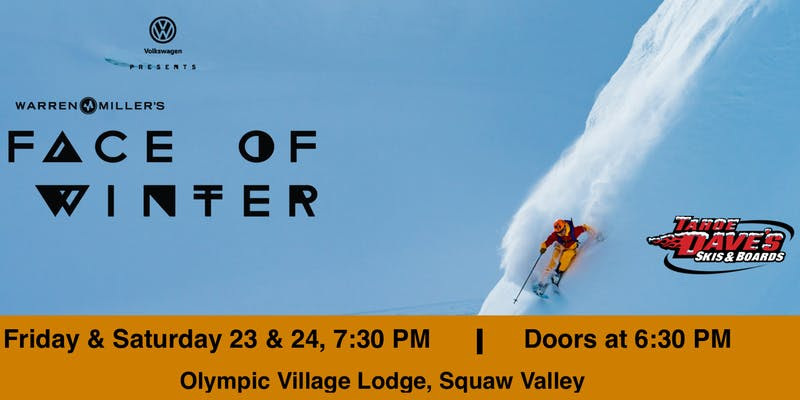 Tahoe Dave’s Skis & Boards will be presenting the North Lake Tahoe Premier at Olympic Village Lodge in Squaw Valley on November 23 & 24 at 7:30 PM. Seating is limited and the show often sells out so get your tickets in advance! ADVANCE TICKETS are available IN STORE at all FOUR Tahoe Dave’s Skis & Boards Locations (Truckee, Squaw Valley, Tahoe City, Kings Beach) or ONLINE by clicking below! PreviousPrevious post:Check Out Our 2019 Ski & Snowboard Demo Fleet!NextNext post:Hey Bud! We’re Hiring Full​-​Time & Part-​Time Employees for the 2018.19 Winter Season!